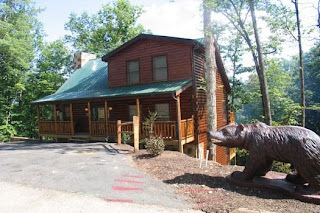 Gatlinburg Cabin Rentals: Why so long? Long time no write. I'm sorry, but I've been so excited building up our other social marketing efforts, I've neglected my first ambitious effort of paying patronage to the Smoky Mountains and Gatlinburg through the blog. Never again will I forget about Gatlinburg cabin rentals that are admired by so many. So, in the future, I will be marrying my efforts with twitter, facebook, and blogger to bring you the most entertaining stories and info Gatlinburg, Pigeon Forge, Sevierville, and the Smoky Mountains have to offer. So now you have Paul Harvey's the rest of the story. To all my faithful audience, get ready for a barrage of inspirational stories, tidbits, tweets, and info on everything new and old that you can enjoy on a weekend getaway or long week with your friends and family. You can also access more info at http://www.auntbugs.com which will include future and past blog posts.